The WK 209 Good Hope is a herring boat moored in Wick. Rumor has it this was the first boat to gauge depth by means of the echo sounder. The contents (of the whisky, not of the boat) matured exclusively on oloroso sherry casks for between 8 and 10 years, but the bottle did not get an age statement. 9.600 one-liter-bottles were filled for the duty free shops. The nose needs quite a bit of time to become good. It starts on carrots, celery, chestnuts, bicycle tyre and chicory. A bit weird, actually. It takes a few moment for the sweet notes to appear: chocolate, hazelnuts, leather and vanilla. Touch of gooseberry and pear. The typical saltiness is quite absent on the nose. The arrival is quite alcoholic and pretty vegetal. Cooked vegetables, even a bit meaty if you know what I mean. A bit like licking leather (which I do not often do, but let’s not go there). Midpalate some candied orange peel, hint of coffee, chocolate and nuts. Loads of cinnamon and nutmeg, but also liquorice. The typical saltiness is now prominently present. The finish is a battle between dried fruits and salt, with a dry mouth as the end result. A special Pulteney, that is the least you can say. But I have a bit of trouble with the duality, the lack of balance. This is a new expression to be released to the Duty Free market (in 1 liter bottles) in about two months time. It is replacing the very successful WK499 ‘Isabella Fortuna’. Bottled at 46%, Unchill-filtered, natural colour, the spirit has been matured entirely in European sherry casks. Limited to about 9000 bottles, only. It’s name is after a steam Herring Drifter WK209 ‘Good Hope’ built in Wick in 1948, first boat in Wick to use echo sounder. I tasted this one at an online tasting event this evening, with a bunch of other whisky bloggers/twitter users. The image is only a mock, mind you, this bottled has yet to hit the shelves, and the color of the spirit may vary from the picture. Look for it next time you fly…. Nose: Wow. Meaty stuff, a bouillon, and quite a few dried fruits, also some note of rubber (rubber balloons!) . A very Masculine nose for sure. Heavy and sweet. One could not have chosen a better dram for today. as it’s The Jewish “Tu Bishvat” the “New year of the trees” , in which it’s customary to eat dried fruit. So much dried fruit here. Palate: Thick, Sweet, Dried fruit compote. Dates, Prunes, Big Time! Coffee also, a drier version of “Kahlua” coffee liquor, Toffee, and then a bit of salty undercurrent. Lovely. Finish: Sweet, on those dried fruits, and coffee. This is a thick sherried expression, ideal for sipping in a cold wintery night, or around a camp fire. The nose is sweet, and quite beefy, Some people will find it too masculine, but i actually liked it. The palate is wonderfully rich and thick, and if you enjoy coffee and dried fruits, you will beg for more. All in all, a very interesting, and not very “Old Pulteney” style dram. If you fly sometime in the near future, i can definitely see myself picking a bottle of this for “later use” … It was a Grand evening. Watch this space for further tasting notes of the other two drams we tasted : the 12 and 17 year old expressions. Many thanks to Lucas from Allembic Comms for arranging the tasting event, and supplying the samples. I meant , Tu Bishvat!!! 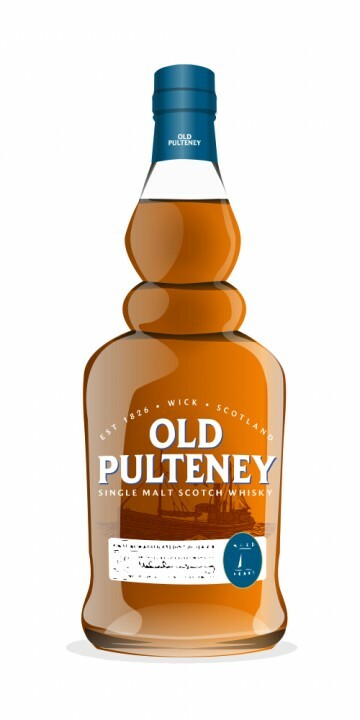 Just like its sibling, Old Pulteney WK209 is named after the registration number of a herring boat called “Good Hope” and based in Wick harbour. In its time, it was a unique boat that was different from all the others. Contrary to WK499, the new WK209 is matured entirely in first-fill European sherry oak. There’s no age statement on the bottle, but it’s said to contain 8 and 10 year old casks. It is bottled at 46%, non chill-filltered, natural colour and limited to 9600 bottles of 1 litre. Nose: starts a little unfresh in my opinion: distinct rubber, maybe even the s-word… but other tasters liked that. Anyway it gradually turns towards more traditional sherry notes. Nutty aromas: praline, chestnuts... A hint of sour apples and a little mint. Leather maybe. Okay but I’m missing the attractive freshness and the coherence of the WK499. Mouth: dried fruits, dark chocolate, overall rather dry. Strong coffee. Plenty of spices (cinnamon, nutmeg). Now also the typical Pulteney salty edge. Liquorice. Brown sugar. Nice fade on roasted nuts. Finish: medium length, half-sweet / half-dry, with hints of cold coffee. WK209 is meant to be a different dram, just like the boat it was named after. They’ve certainly succeeded, but I wouldn’t trade one bottle of my WK499 for two of this WK209. It will be available around March / April. No no, Old Pulteney 12 and certainly 17 were very good. This one slightly disappointed me. It's not at all a bad whisky, it just suffers from the comparison with WK499 and the others. Of course, if you happen to like the rubbery nose (which apparently lots of tasters did), it's immediately more attractive.